The new official PES 2016 Data Pack 3.00 has been released with more than 199 new faces, Stade de France, 10 new boots, update all the transfers until the date of February 8, 2016 and more. Size 1.28 GB full DLC. Copy download folder in Pro Evolution Soccer 2016 folder. Konami released a new content for PES 2016, including the UEFA Euro 2016 DLC and Data Pack 3, PES 2016’s biggest update for the game yet, bringing a whole host of content including the fantastic UEFA Euro 2016 content (free for all PES 2016 players). Includes 15 of the new kits for France, Germany, Italy, Spain, Czech Republic, Turkey, Iceland, Slovakia, Ukraine, Northern Ireland, Croatia, Albania, England, Portugal and Wales. : Kits across Europe and South America have also been updated. The official Euro 2016 kits for England, France, Croatia, Turkey and Portugal will be released as a free DLC before the tournament starts in June. The teams getting new kits include Udinese, Empoli, FC Groningen. Willem II, Espanyol, Eibar sides and 10 second-tier Liga Adelante sides. There is also new strips for UEFA Champons League teams FC Groningen, Marseilles, Sporting Lisbon, and AS Saint-Etienne. 14 South American sides from the Brazilian and Argentinian sides will also be updated, including Flamengo, Corinthians, and Union de Sante Fe. Data Pack 3 also features 199 new player faces as Gareth Bale, Dele Alli, Andriy Yarmolenko, İlkay Gündoğan and Juan Mata. The ratings of those who have performed well during the season will also be reflected, as Jamie Vardy, Kingsley Coman, Dimitri Payet, Douglas Costa, Gianluigi Donnarumma and Riyad Mahrez ratings. There is also new boots and balls added into the game. Hypervenom Phantom II NJR will be included, PUMA’s evoSPEED SL, evoPOWER 1.3 and PARA Mexico Lite 15 HG JP. The official balls of the UEFA Champions League and UEFA EURO 2016 tournaments will also be added. Source: winningelevenblog. Konami Official: Data Pack 3.0 is available to unduh for PES 2016 on all formats. 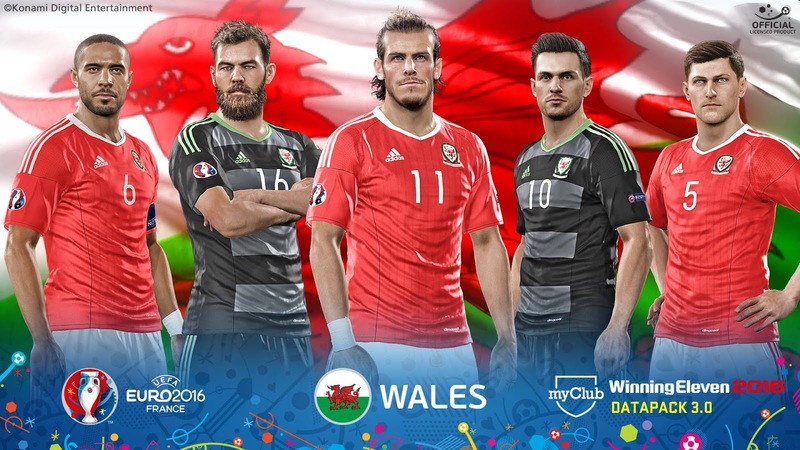 The update adds a variety of content to the game including the exclusive EURO 2016 DLC. Full details in the press release below. “Konami Digital Entertainment B.V. has detailed the newly released content for its key third Data Pack for PES 2016. Made available today, the free update adds UEFA EURO 2016 content that features new national team licenses, tournament branding, official tournament mode, official match ball and Stade de France. In addition a wealth of player faces, stat upgrades and boots create a significant update for PES 2016. KONAMI is committed to continually enhancing the PES 2016 experience and, since launch, has added hundreds of stunning player likenesses to the game, alongside gameplay refinements and key myClub advances. Data Pack 3 marks the most sizable update yet. Data Pack 3’s kit updates will bring the latest licensed designs up to date, and includes 15 of the new kits that will premiere during the UEFA EURO 2016 competition, including those of match officials. Updated kits include hosts France, Germany, Italy, Spain, Czech Republic, Turkey, Iceland, Slovakia, Ukraine, Northern Ireland, Croatia, Albania, England, Portugal and Wales – the latter of which features Gareth Bale, cover star for KONAMI’s UEFA EURO 2016 content. Club kits across both Europe and South America will also be updated, from Udinese and Empori in the Italian League, FC Groningen and Willem II in the Dutch Eredivisie, La Liga’s Espanol and Eibar sides and 10 second-tier Liga Adelante sides. The new UEFA Champions League strips for FC Groningen, Marseilles, Sporting Lisbon, and AS Saint-Etienne will also be recreated; while 14 South American sides from the Brazilian and Argentinian sides will be updated, including Flamengo, Corinthians, and Union de Sante Fe. PES 2016 is famed for its realism in the reproduction of players, as well as their abilities, and Data Pack 3 boasts extensive updates to the likenesses and current ratings of its roster. 199 new player faces have been produced to ensure almost photo-realistic likenesses. Many of those created are set to play pivotal parts within this summer’s UEFA EURO 2016 competition, with players from every qualified side enhanced and updated. As such, players such as cover star Gareth Bale, Dele Alli, Andriy Yarmalenko, İlkay Gündoğan and Juan Mata will boast the most detailed likenesses of any football game, while Data Pack 3 will also mirror their current form. PES 2016’s Player ID will also boast refinements to ensure that individual players boast the same movements and ability of their real-life counterparts, while the Team ID system will ensure that teams line up in their favoured formations and playing patterns. KONAMI updates PES 2016’s player rankings on a weekly basis to mimic the form of its player roster to match that of real-life. Data Pack 3 will offer a larger update and amend the ratings of over 1400 players in both online and offline modes to reflect their overall mid-season performances, with the likes of Jamie Vardy, Kingsley Coman, Dmitri Payet, Douglas Costa, Gianluigi Donnarumma and Riyad Mahrez amongst others to see their ratings soar. This level of detail ensures that PES 2016 and the UEFA EURO 2016 content will be as true to current form as possible, with key improvements and otherwise reflected in-game. Data Pack 3 will also add new boot and ball styles to the main game. NIKE’s Hypervenom Phantom II and Hypervenom Phantom II NJR styles will be included, as will PUMA’s evoSPEED SL, evoPOWER 1.3 and PARA Mexico Lite 15 HG JP designs. The official balls of the UEFA Champions League and UEFA EURO 2016 tournaments will also be added, further showcasing PES 2016’s exclusive use of these key club and national team competitions.